Ucluelet on Vancouver Island is a premier location to Catch both Salmon and halibut, and our 2019 season is filling up quickly. 2018 was a good and very consistent season, with Chinook (king) salmon averaging 15-25lbs. The Season was much better than predicted. Ucluelet will continue to be one of the most consistent places in the Pacific North West to catch Salmon, as it has the largest feeding area on the coast for a variety of fish including: salmon, halibut, ling cod and snapper. To get here from within Canada, you can fly into Comox, Nanaimo or Victoria then enjoy a short scenic drive or take the Ferry From Vancouver. A 3 day, 4 person trip starts around $1425PP. Our experienced guides will make the most out of your time on the water. Our trips are all private (just your group and your guide) so you can target the species of your choice. 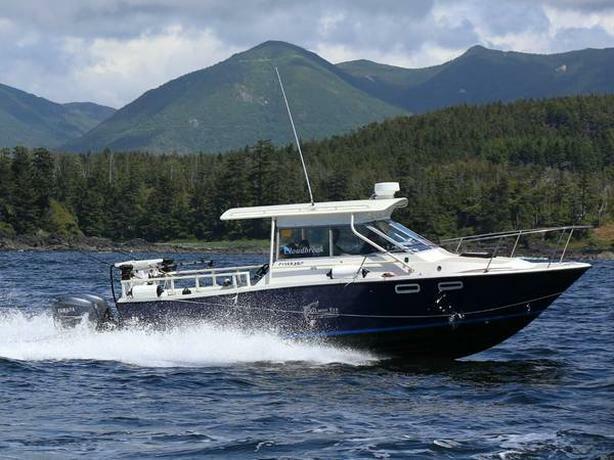 Our 27-29ft boast have heated cabins and large decks for your comfort. Check out www.salmoneye.net/site/fishing-packages.html for all our packages. We start fishing in March and wrap up in late September.